reifencom GmbH is Germany’s multi channel specialist for tyres and wheels with a wide product range. In Germany alone, there are 37 Filialen, the online shop reifen.com and 3,750 affiliated fitting partners that provide supplementary services. In France, Austria, Italy, Switzerland and Denmark, reifencom GmbH is active with one further shop each and more than 4,160 cooperating fitting partners. The product range extends from passenger car tyres, rims and complete wheels to motorcycle as well as off-road and van tyres and accessories. reifencom GmbH, that was merged in 2001 from the two companies of the tyre traders Heiko Knigge and Olaf Sockel in Bielefeld and Hanover, each founded in 1989, has been merged with the common purchasing company (Einkaufsgesellschaft) to form “one” reifencom GmbH with its current seat in Hanover in 2018. At the end of 2015, the company was sold to Apollo Tyres Ltd., a major tyre manufacturer with its seat in India. reifencom GmbH is a member of the Bundesverband Reifenhandel und Vulkaniseur-Handwerk e. V. (German Tyre Retailer and Vulcanization Trade Association). With our approximately 500 employees in the company headquarter in Hanover, the logistics centre in Hildesheim and the branches throughout Germany, we are working on satisfying our customers day by day. We ensure this high standard with state-of-the-art logistics and an absolute focus on perfect services. In order to meet the most varied customer requests, we have an extensive portfolio of manufacturers in the areas premium, brand and quality tyres. Our rim offers also leaves little to be desired. You can easily and conveniently assemble your desired complete wheel with the rim configurator in our online shop. Our service team in Hanover checks every aluminium rim and complete wheel order for technical reliability. In our online shop we further offer extensive information for the tyre and rim selection. Information about availability, test results for the products and customer ratings also serve as advisory support. The delivery within Germany is free of delivery costs for orders or two tyres or more, and for motorcycle tyres for orders of one tyre or more. If you have any questions, you can reach our helpful staff, who will assist you fast and competently via phone or email. The exemplary consulting quality has been confirmed several times through independent tests and customer ratings. The focus has always been perfectly functioning logistics so that a high degree of availability can also be guaranteed in peak seasons such as spring or autumn. This task is performed by the logistics centre build exclusively for this purpose. More than 600,000 tyres and 200,000 rims are waiting for customers orders in the central warehouse with a total area of 42,000 square metres. At peak seasons almost 60,000 tyres and rims leave the warehouse daily. The online shop reifen.com was winner in the sector online tyre traders at “Service-Champions”, Germany’s most important service ranking (ServiceValue GmbH in cooperation with DIE WELT) for five years in a row from 2014 until 2018. In 2018, reifencom made it into COMPUTER BILD’s “TOP SHOPS” recommendation list for the forth time in a row, and achieved first place at “Deutschlands bester Händler” (Germany’s best retailer) from Handelsblatt. 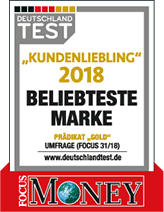 In 2018 reifen.com has received further top rations such as “Germany’s best online shops 2018“ (n-tv and DISC), “Highest recommendation” (ServiceValue in cooperation with “DEUTSCHLAND TEST“), “Customer’s Favourite” (Focus Money) and “Germany’s most desired brand” (F.A.Z. institute). Reifencom took first place in the online tyre trade in the Customer Loyalty study by “DEUTSCHLAND TEST“ (FOCUS 9/2018).